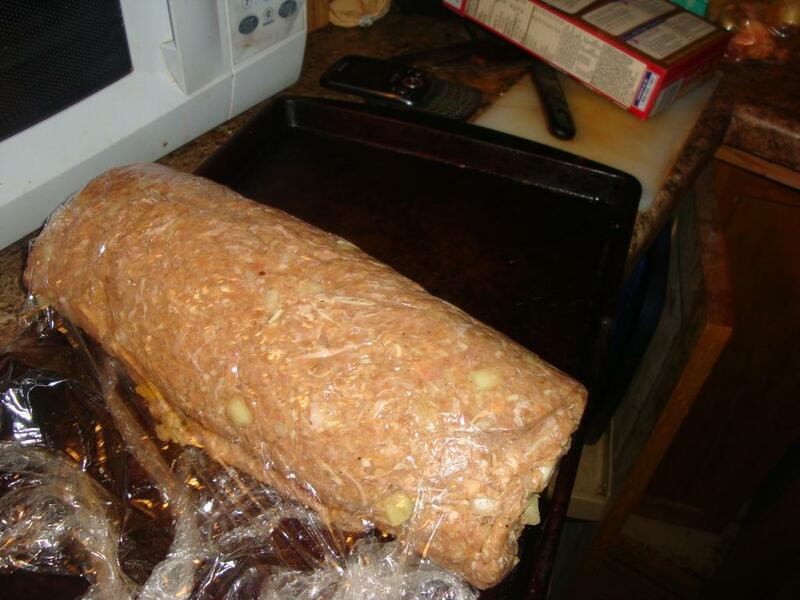 First off, I should say…and this is not to brag but…I make the best damn stuffing in the world. I got the recipe from my mother who got it from her mother who got it from HER mother who…well, I don’t know where she got it from but it’s good! 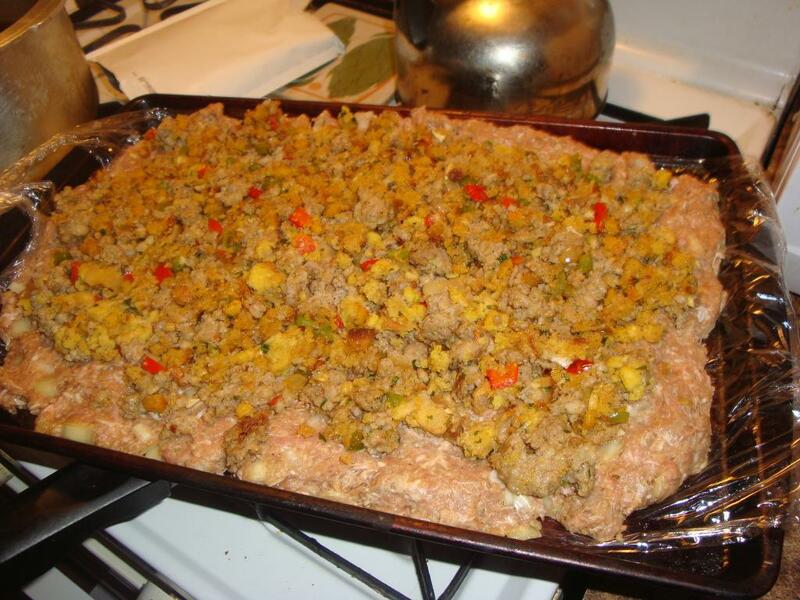 For those who attended the Holiday Preview or who ordered the Portable Preview, you got the recipe for a variation of that stuffing: my low-carb cornbread craisin stuffing. The main difference between that and what I take for the fam is that I don’t use craisins and I added some browned, spicy pork sausage. Due to a food contribution mishap (one of my cousins brought stuffing and arrived before I did to dinner), I ended up with a lot of extra stuffing. La Petite Diva loves the stuff, but it’s not so great on the stats end. Since I knew we were doing leftovers week, I endeavored to figure out how to get more protein bang for my stuffing buck. Then the other day I was flipping through a magazine and saw a swirl cake. You guys know about my love of rolling things. 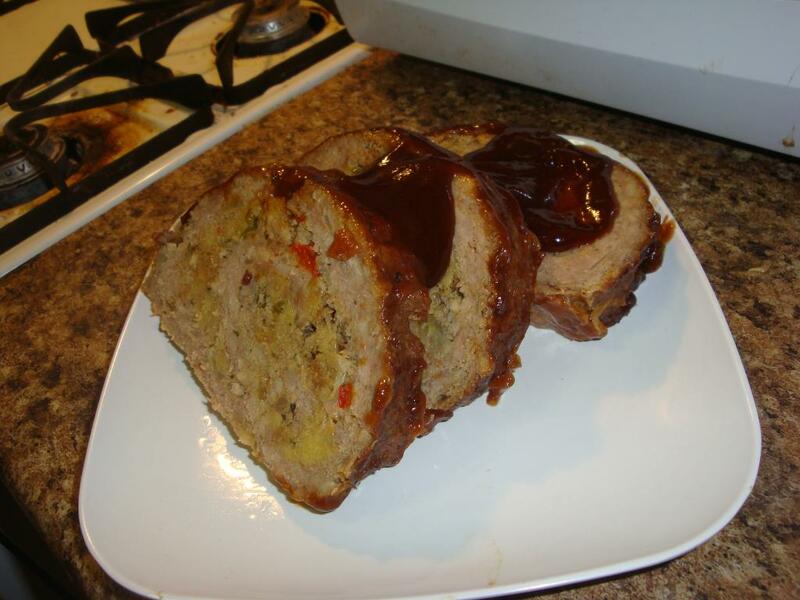 Well, just then the idea popped into my head: why not make a swirly meatloaf using my stuffing! Mix ground meat and TVP in a bowl. Cover it and walk away for about five minutes. Trust me…walk away! Or better yet, sautee your onions and peppers. Also, set your oven to 350. Now come back and add your eggs, shredded cheese and soy sauce. Add the onions and peppers and mix well. Line a cookie sheet with plastic wrap with about 4 inches of overhang on each side of the sheet. Place your meat on the plastic wrap and press it flat until it reaches about ½ inch thickness. 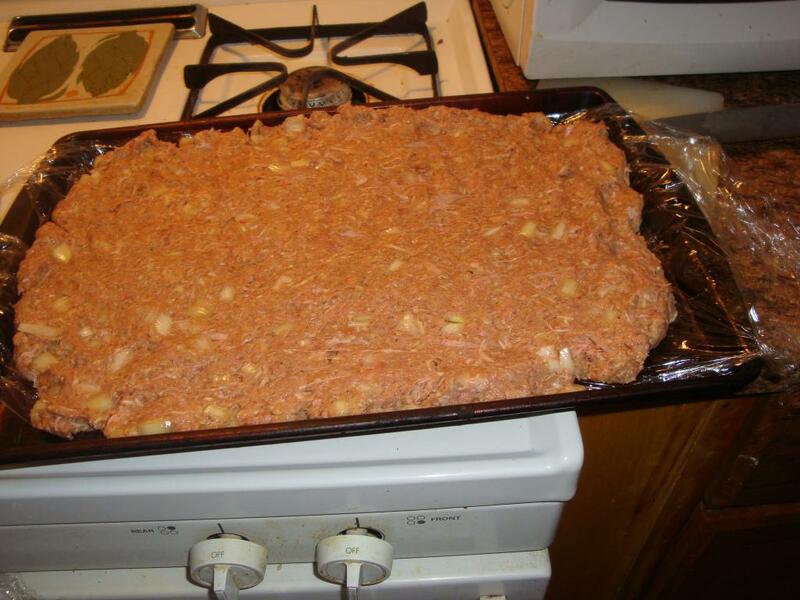 Cover “meat sheet” with stuffing mix. Transfer the log to a baking pan, seam side down and pinch the sides closed. 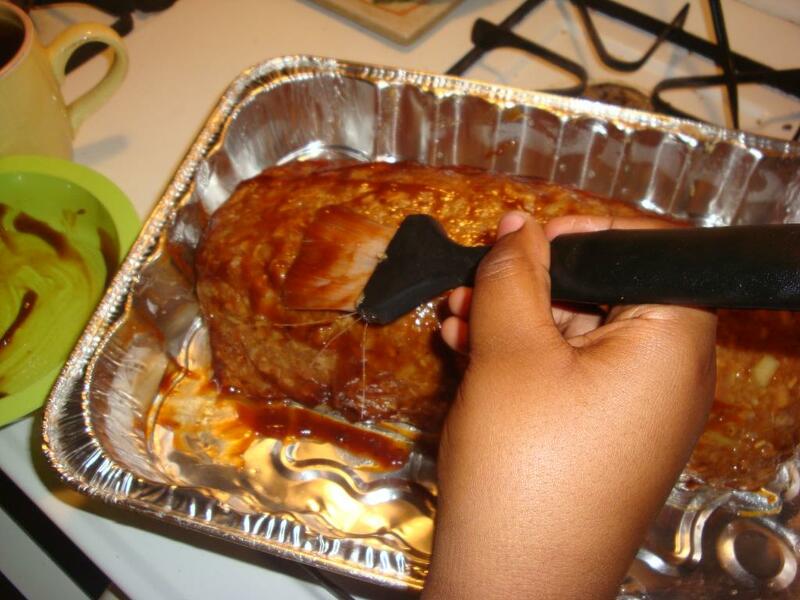 Brush with barbecue sauce and then cover with aluminum foil. Bake for 40 minutes. Remove from the oven and cover with the remaining barbecue sauce and bake an additional 15 minutes. Allow to cool 10 minutes before cutting. This dish is a winner! Although, using turkey, the swirl isn’t as apparent as I’d like it to be, I can see it. 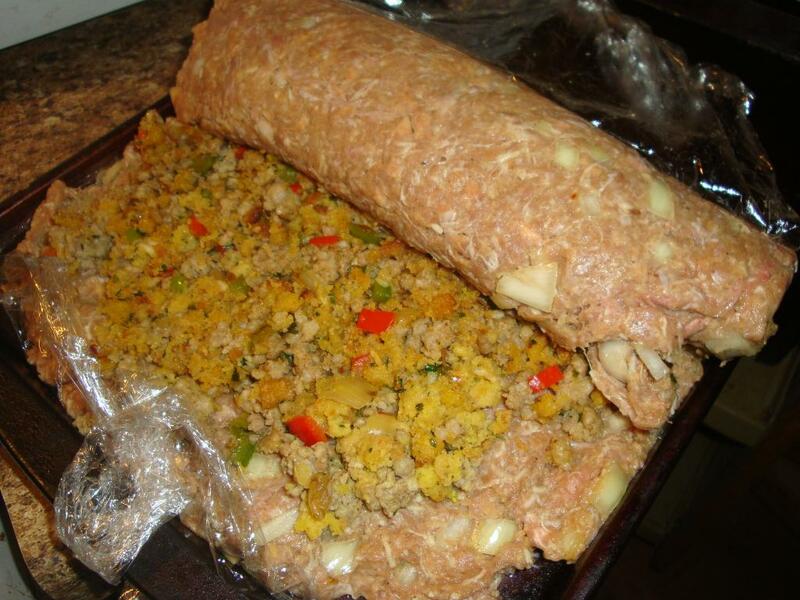 And the stuffing kept everything wonderfully moist. I didn’t add much salt and seasonings to the meat because there was a lot in the stuffing already. I imagine mashed potatoes would work in place of stuffing if that’s your thing. This year I infused my mashed potatoes with Any Whey unflavored protein and NOBODY knew the difference (seriously…that stuff is like magic…). So with the meat, the TVP and the protein mashed potatoes, that would be a slam dunk of nutrition! I didn't. I actually wanted to try to use the Walden's Farm zero cal sauce but it was…horrendous! Never EVER use that stuff! Even the divas agreed. They said it smelled like nuclear meltdown. There are other kinds, I know. For some reason BBQ sauce doesn't bother me (and I do dump…I think it's cuz I always eat bbq sauce with protein) so I just used a cup of the regular stuff. But you do what you think is best with your recipe! Play with your food! I tried it myself and it's really delicious. Thanks a lot for sharing. I also like the recipes that cooked on gas grill. Did you rehydrate the TVP or add it in dry? I usually put it in dry and use a bit of a higher fat cut of meat to keep the moisture. If you use a lean meat, rehydrate your TVP with water and whatever spices you'll use in your meat mixture before adding.